Attention all baking connoisseurs: look away. This is the easiest, laziest, banana creme pie you've ever seen and you may not want to stoop to my level of store-bought pie crust. 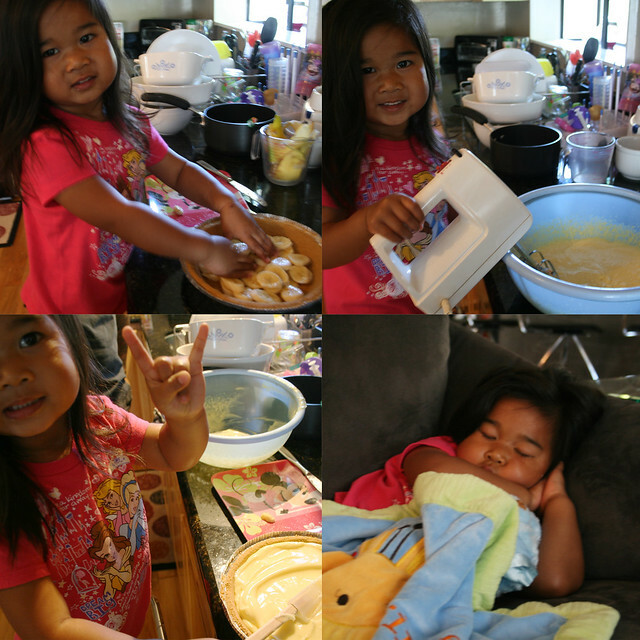 I could attribute the "ease" of this recipe to the fact that I wanted 3 year old Raine to help me out, but the real truth is that I didn't have a lot of time and I wanted 3 year old Raine to help me out. The real pie from scratch calls for making your own custard (time consuming) and your own graham cracker crust (buttery and messy) so I took the easy road and made substitutions where I saw fit. Peel two bananas and slice. Place flat at the bottom of the pie crust until the bottom is covered. Empty the instant pudding contents into a bowl and mix with the cold milk for at least 5 minutes, until the pudding thickens. 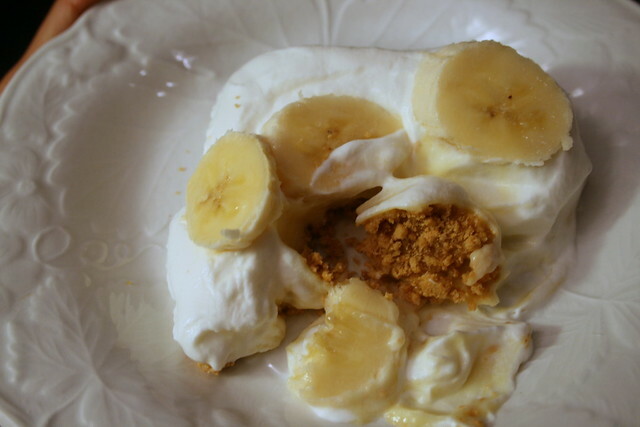 Layer the pudding on top of the bananas in the pie dish and put the whole thing in the fridge. Place a medium metal bowl and your whisk into the freezer and wait 10-15 minutes until the bowl and whisk are chilled. * Whisk together heavy cream and powdered sugar** until the mixture just begins to thicken. Add vanilla. Continue to whisk until stiff peaks form. Layer on top of the pudding. Chill in the fridge for at least 1 hour. 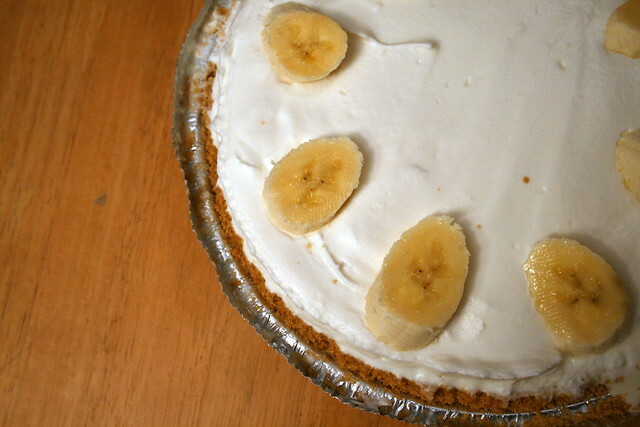 Just before serving, slice up the last banana and decorate the pie. This pie is not built to stand on its own. 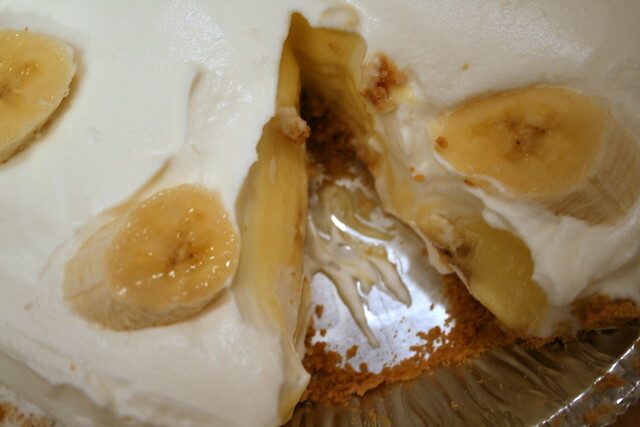 It's very likely that every slice will be a blob on banana-creme-graham-cracker-goodness, and that the pie will cave as slices are taken out. You should know that this is normal and okay, because it's delicious. *This is just a tip to make sure the whipped cream comes together faster and easier for you. **You can keep adding sugar until you find the sweetness you prefer.